HOUSTON — I just might defy gravity today. I'm sitting with a team of aerospace and mechanical engineering students from the University of California, San Diego, that are counting down to their first chance to fly on a ZERO-G aircraft to perform a weightless fire experiment under NASA's Microgravity University Program. The UCSD Microgravity Team, led by senior Sam Avery, is poised to fly on a modified Boeing 727 jet designed to provide brief periods of weightlessness during a series of acrobatic parabolic flights. Today, Avery and two team members, Jack Goodwin and Daneesha Kenyon, will take the first flight shift to perform their experiment during an afternoon flight today. Other members will fly on Friday, if the weather — which has been dismal all week — holds true. 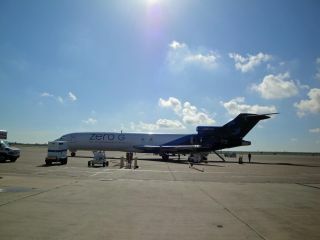 Right now, it's a bright, sunny day here at Ellington Field, near NASA's Johnson Space Center. You can follow the progress of today's NASA Microgravity University Program flight via the program's Twitter feed @NASA_RGEFP and the hashtag #DefyGravity. UCSD Microgravity Team member Nico Montoya has been posting updates about the team's work at @NicoSuave9.